Join the investigation on Dex Parios's first case for just $10! Dex is the proprietor of Stumptown Investigations, and a fairly talented P.I. Unfortunately, she's less adept at throwing dice than solving cases. Her recent streak has left her beyond broke-she's into the Confederated Tribes of the Wind Coast for 18 large. But maybe Dex's luck is about to change. Sue-Lynne, head of the Wind Coast's casino operation, will clear Dex' debt if she can locate Sue-Lynne's missing granddaughter. Is this job Dex's way out of the hole or a shove down one much much deeper? 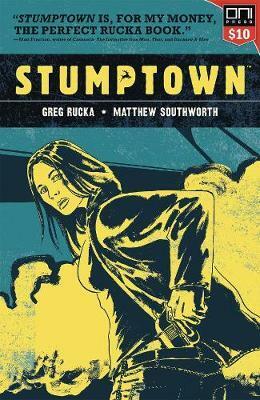 Greg Rucka was born in San Francisco and raised on the Central Coast of California, in what is commonly referred to as "Steinbeck Country." He began his writing career in earnest at the age of 10 by winning a county-wide short-story contest, and hasn't let up since. He graduated from Vassar College with an A.B. in English, and from the University of Southern California's Master of Professional Writing program with an M.F.A. He is the author of nearly a dozen novels, six featuring bodyguard Atticus Kodiak, and three featuring Tara Chace, the protagonist of his Queen & Country series. Additionally, he has penned several short-stories, countless comics, and the occasional non-fiction essay. In comics, he has had the opportunity to write stories featuring some of the world's best-known characters--Superman, Batman, and Wonder Woman--as well as penning several creator-owned properties himself, such as Whiteout and Queen & Country, both published by Oni Press. His work has been optioned several times over, and his services are in high-demand in a variety of creative fields as a story-doctor and creative consultant. Greg resides in Portland, Oregon, with his wife, author Jennifer Van Meter, and his two children. He thinks the biggest problem with the world is that people aren't paying enough attention. Matthew Southworth is a musician, playwright, filmmaker, and cartoonist who has living in Seattle, Washington. He used to lead a band called the Capillaries, and they never broke up. He directed an independent feature film that he very nearly finished. He came this close to getting his Masters in playwriting and directing from Carnegie Mellon University. In addition to Stumptown, he has drawn comics for Marvel, DC, and Image.